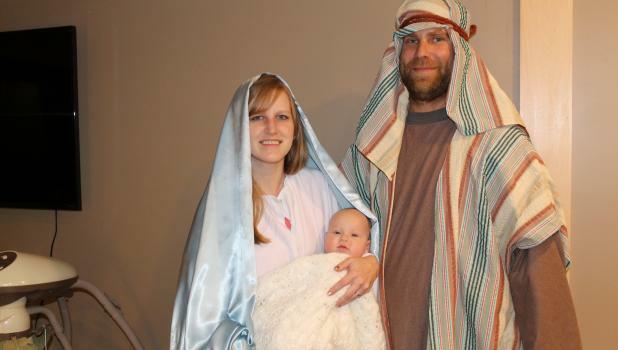 Adam and Samantha Hesse and their four-month-old daughter, Rowyn, will portray Joseph, Mary and the Baby Jesus in the 2018 Springfield Nativity Pageant. The Hesses are “excited” to play the role. The kings in the pageant will be portrayed by Ed Meidl, John Fank and Dan O’Callgahan, and their slave will be played by Noah Mueller. Springfield High School Principal Pat Moriarty has the role as King Herod. Scribes are Xandar Asmus, Carter Asmus, Shane Clemmon and Tyson Meidl. Liz Klaunde will perform as the Angel Gabriel. Rachel Krueger will portray Mary as she visits her cousin, Elisabeth. Laurie Krueger has the role of Elisabeth. Innkeeper and Townspeople families include the James and April Bigelow family and the Cliff and Sarah Heglund family. Jennie Vanderwerf and Jill Moriarty are choreographers of the angels. The pageant includes a host of angels and a group of shepherds.